Swipe: verb; the act of moving one’s finger across a touch screen. I recently overheard a woman on the subway telling her friend that her toddler “swipes” everything in their house – the coffee table, books, plates and even her own mother, trying to make her disappear like an image on a touch screen. The story got me thinking that for many of us, our knowledge of what’s going on behind that glossy display isn’t much more than a toddler’s. Before I started researching how touch screens worked, I figured there was one universal technology behind the “swipable” phenomenon. Instead it turns out there are half a dozen, and more being researched every day. The two most commonly used systems are resistive and capacitive touch screens. For the sake of simplicity, I will focus here on these two systems and finish with where experts think touch screen technology is headed. One of those thin yellow layers is resistive and the other is conductive, separated by a gap of tiny dots called spacers to keep the two layers apart until you touch it. (A thin, scratch-resistant blue layer on top completes the package.) An electrical current runs through those yellow layers at all times, but when your finger hits the screen the two are pressed together and the electrical current changes at the point of contact. The software recognizes a change in the current at these coordinates and carries out the function that corresponds with that spot. Resistive touch screens are durable and consistent, but they’re harder to read because the multiple layers reflect more ambient light. They also can only handle one touch at a time – ruling out, for example, the two-finger zoom on an iPhone. That’s why high-end devices are much more likely to use capacitive touchscreens that detect anything that conducts electricity. Unlike resistive touch screens, capacitive screens do not use the pressure of your finger to create a change in the flow of electricity. Instead, they work with anything that holds an electrical charge – including human skin. (Yes, we are comprised of atoms with positive and negative charges!) Capacitive touch screens are constructed from materials like copper or indium tin oxide that store electrical charges in an electrostatic grid of tiny wires, each smaller than a human hair. Newer touch screen technologies are under development, but capacitive touch remains the industry standard for now. 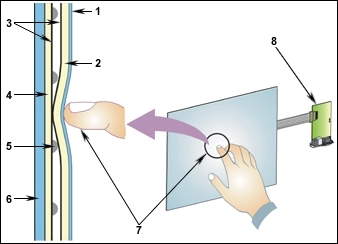 The biggest challenge with touch screens is developing them for larger surfaces – the electrical fields of larger screens often interfere with its sensing capability. Software engineers from Perceptive Pixel, which designs multi-touch screens, is using a technology called frustrated total internal reflection (FTRI) for their larger screens, which are as big as 82-inches. When you touch an FTRI screen you scatter light – and several cameras on the back of the screen detect this light as an optical change, just as a capacitive touch screen detects a change in electrical current. 82 inches? That’s the perfect size for a swipeable coffee table. I’m also kind of wondering now if one could design a screen where voltage spikes were detected and the local voltage was dead? Wud that save battery? Would they be called inductive screens? I’ve always wondered how touch screen works. Thanks for the explanation! Nice information, you explained working of touch screen comprehensively. But i have one small doubt. How screens recognize the object, i mean how they recognize whether it is a finger or some other object. Please reply me. How did you know that i was looking for this information.. really i loved your article and thanks a lot. This is my request to please write about multi touch technologies. Hope will hear from you soon. Keep it up mate. I found this extremely helpful! Thank you! I was writing a research report on how touch screens work and this was exactly what I needed. I don’t know I can thank you enough. Cell phones recognise the size of what is touching the screen. Thank you very much for the insight.. but I still wonder, if these screens work by detecting voltage drops caused by your hands coming in contact with the screen, why do phone screens with protective glass screen guards still work? Thanks Allison for putting together this article. I feel better informed. Are there several suppliers for the tech.. or do each company Apple Android develop the next generation of touch screens in house? Well explained and I got some stuff here. Thank you very much and keep posting. It’s a wonderful device who invented it for the first time. In capicitive touch screen, how does circuit complete, when there is a screen guard (I think it’s totally made of plastic)? Great, eye-opening & simple to understand article! The chip that controls the touch screen “scans” along, selecting in turn each column of the x axis, then reads a signal from the y axis that is (roughly) zero if not touched, or a number proportional to the height if there is a touch. The values of the x and y are returned to the software, along with a value for z, which is how hard the point has been pressed, derived from the resistance at the pressed position. I would like some advice regarding how to go about purchasing a touch screen for display in a visitor center. This is a small venue, which caters to families. We would like to install something that would allow folks to access information about the natural environment in our area. We are starting from scratch. We don’t have a great deal of money to invest, however, we do have experts to provide content. We need advice on the platform that would be best, the software that is the most bullet proof (small children will be using it) and the best low priced screen. Can you point me to a source that will not try to sell me something, but will suggest the best options? will a touch screen work if my fingers are cold and/or dry i.e., no oils or moisture. As you said capacitive touch display works with anything that conducts electicity but what about metels… they conduct electricity tooo… but if we tried to use some metel which conducts electricity well instead of our skin, the touch screen doesn’t work. I’ve this same doubt. Reply fast. Email me or anything…. Great , I didn’t Know about touch screens ,but this article helped me understand more about it. So how come the hollow rubber tipped “pens” work on the Capacitive screens of my iPhone and iPad – if hollow-rubber is actually insulation against electrical charge and stops a circuit being formed? Could I use – and get the improved precision & control of – a rubber pencil? IE a pencil that has rubber through the middle – not lead. But maybe that is the next best thing. Field effect touch screen. Not more than a toddler! Very true. That’s to the extend l knew about touch screens before l read this. I’d like to think l’m the man of science and not knowing anything about these gadgets -l’m using right now to write this- was kind of nuisance for me. Now l feel confident enough to talk about this in the company of friends the next time we have a discussion in a café and l certainly owe that to you madam. Thank you so much. All around clarified and I got some stuff here. Much thanks and continue posting. Extraordinary, I didn’t think about touch screens, however, this article helped me see more about it. That cleared the cloud…Thanks mate!